OnePlus is preparing for the launch of OnePlus 6T next month. 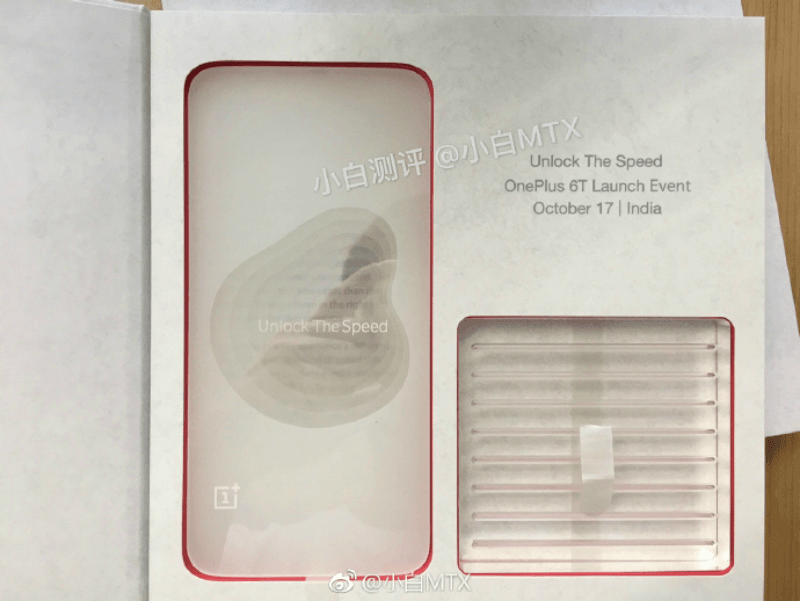 According to a new physical invite image leak on Chinese microblogging portal, Weibo, OnePlus will hold a global launch event in India for the OnePlus 6T. That being said, we’re not sure about how legitimate is this leak, but an Indian invite surfacing on a Chinese social media platform is something we haven’t seen in the past. It won’t be a surprise if OnePlus holds a global event of OnePlus 6T in India, after all, the Chinese smartphone maker has a massive fanbase in the country. The OnePlus 6 generated Rs 100 crores of revenue in India for the brand in less than a few hours of launch. OnePlus is yet to confirm the launch date of the OnePlus 6T officially, however, various leaks on the web are revealing the launch date of the phone as October 17. Even the screenshot sent by OnePlus to CNET also has the date as October 17. So, it’s nearly confirmed the date would be October 17, but we’re expecting OnePlus to make an official announcement in the next one week or so. Notably, OnePlus started teasing the OnePlus 6 way ahead of the launch event, so expect the same this time around too. The physical invite leaked online has the tagline ‘Unlock the Speed,’ which could be referring to the in-display fingerprint scanner. Since the OnePlus Two, OnePlus launched smartphones with a physical biometric sensor placed either on the front or rear. But OnePlus always stated that it wanted to keep the fingerprint scanner on the front side. Thanks to the 18:9 and 19:9 displays on the OnePlus 5T and OnePlus 6, the company had placed the fingerprint scanner on the rear. But OnePlus is putting the fingerprint scanner on the front, courtesy of in-display fingerprint scanning technology. OnePlus created a lot of hype around its smartphone, but it’s surprising to see the company stay silent regarding its upcoming smartphone. Compared to the OnePlus 6, the 6T will have an in-display fingerprint scanner as opposed to the rear-mounted physical scanner; the phone is also expected to feature triple cameras on the back and a bigger battery. The OnePlus 6T will also lack the 3.5mm headphone jack and the company is promising better battery life on the 6T. OnePlus is also running TV ads featuring Amitabh Bachchan touting the phone will be faster and also has an innovative way of unlocking- mostly related to the in-display fingerprint scanner. Hardware side of things, the phone will likely feature the same Qualcomm Snapdragon 845 chipset, clubbed with up to 8GB of RAM and 256GB of internal storage. The phone might boot Android 9 Pie out of the box.